I've watched these at night while camping, and always wondered what they were. Now we know. Noctilucent clouds are bright cloudlike atmospheric phenomena visible in a deep twilight. The name means roughly night shining in Latin. They are known as polar mesospheric clouds when observed from a satellite in space. They are most commonly observed in the summer months at latitudes between 50° and 70° north and south of the equator. They are the highest clouds in the Earth's atmosphere, located in the mesosphere at altitudes of around 75 to 85 kilometers (47 to 53 mi). They are normally too faint to be seen, and are visible only when illuminated by sunlight from below the horizon while the lower layers of the atmosphere are in the Earth's shadow. Noctilucent clouds are not fully understood as meteorological phenomenon. Clouds generally are not able to reach such high altitudes with such thin air pressures. They were first reported in 1885 two years after the eruption of Krakatoa, so it was proposed that they were made of volcanic dust, or maybe meteoric dust. They are now known to be primarily composed of water ice, confirmed by UARS, and it has been suggested that they may be related to climate change. 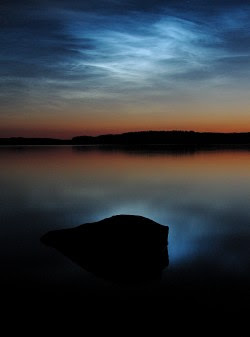 Dr. Michael Stevens of the United States Naval Research Laboratory believes space shuttle exhaust may contribute to the formation of noctilucent clouds. Imaging has also shown that some debris clouds from various space accidents have been mistaken for noctilucent clouds. It has been suggested that a transition to a hydrogen economy could increase the number of noctilucent clouds through increased emissions of free hydrogen. Noctilucent clouds can be studied from the ground, from space, and directly by sounding rockets; they are too high to be reached by weather balloons. Noctilucent clouds were first detected from space by an instrument on the OGO-6  satellite in 1972. More recently they have been extensively studied by the Swedish satellite Odin  launched in 2001. The AIM satellite mission, launched in 2007, is dedicated to research into noctilucent clouds. Exhaust from the space shuttle's main engines and some other launch vehicles is composed almost entirely of water vapor. About half of the vapor is injected in the thermosphere, typically at altitudes of 103 to 114 kilometers (64 to 71 mi). Studies have shown that this exhaust can be transported to the Arctic region in little over a day, although the exact mechanism of this very high-speed transport is unknown. As the water migrates northward, it falls from the thermosphere down into the colder mesosphere, which occupies the region of the atmosphere just below. Over the North Pole in the summer, mesospheric temperatures can plummet below −140 °C (−220.0 °F), the lowest found in the Earth’s atmosphere. At these temperatures, water vapor condenses into ice particles and clouds form. ^ Thomas, GE; Olivero J (2001). 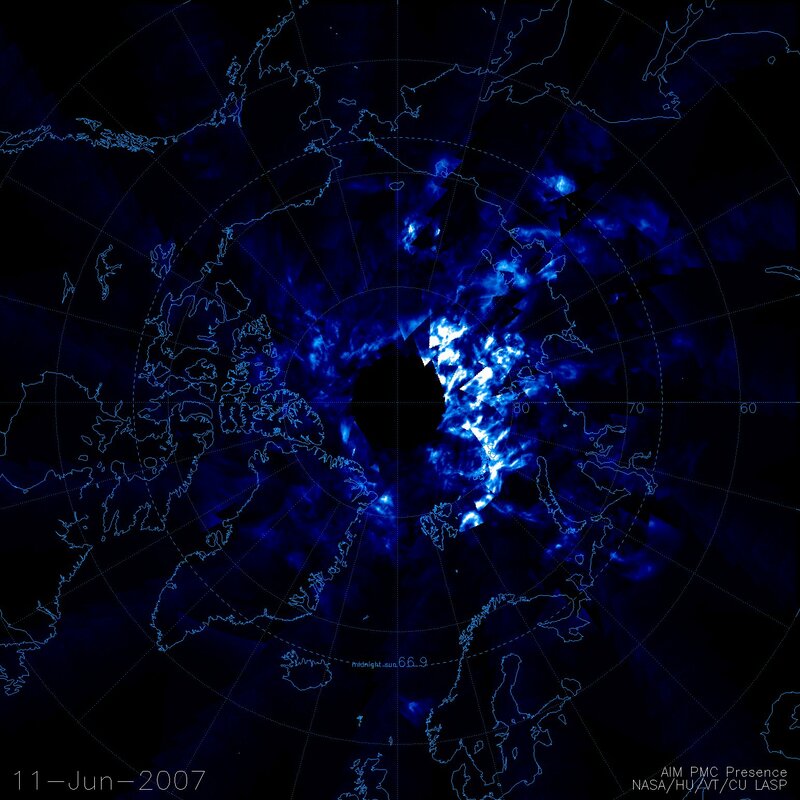 "Noctilucent clouds as possible indicators of global change in the mesosphere". Advances in Space Research 28: 939–946. Night-shining clouds 80 kilometers above Earth's surface. Image data from the Aeronomy of Ice in the Mesosphere (AIM) satellite, NASA.